From Wadi Rum you and your guide will visit the Nabataean Temple, which is located close to Rum village and features ancient Thamudic and Kufic rock art. The temple was erected around the first century BC. Next we'll drive you to Lawrence Spring where you can climb and take pictures of the incredible view. After this you will go to see the Map and then the Sand Dunes, which are a large area of sand dunes piled up against the mountains. It's fun to climb to the top and then run down. Then we'll take you to see the Ancient Inscriptions and afterwards you'll go by the Lawrence House. Next we will drive you to the Burrah Canyon where we will drop you off with a map and you'll hike for about two hours in this beautiful setting. At the end of the hike you will have lunch, Bedouin tea and then continue to the Burdah Mountain where you'll see the big bridge from the ground. After that we'll take you to the Um Frouth Rock Bridge. You will have an opportunity to climb this bridge. Next is the Small Arch Bridge which you can also climb easily. Then you'll go to Khazali Canyon where you can walk inside to see the inscriptions. Afterwards we'll take you to the camp where you can put your things in your tent, have a shower, sip Bedouin tea before viewing the setting sun at a gorgeous site called Al Ghuroub. If you arrive at the camp early you may walk to this site or take a leisurely hike in the area. Jabal Um Addami is the highest mountain in Jordan and is located right on the border with Saudi Arabia. If you are on top of the mountain you can see Saudi Arabia and even the Red Sea on a clear day. 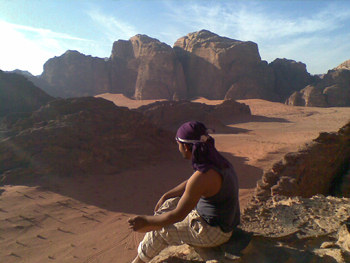 Jebel Um Adaami is 1832m above sea level; by comparison Wadi Rum village is 1000m above sea level. After breakfast we will drive you through the desert some 40kms to the south to Jebel Um Addami. This is a magnificent drive through the far valleys of Wadi Rum and crossing the beautiful and lonely Wadi Saabit. Upon arrival you will have a guided hike to the top which usually takes about 2 1/2 hours. You'll hike up Jabal Um Addami and then after resting at the top, you'll descend to a nice secluded area. While you rest and explore the area, your guide will start cooking your lunch. After the lunch you can hike for 2 hours and then we drive you by jeep to the Bedouin Lifestyle Camp where you can watch the beautiful sunset and spend the night while enjoying music, songs, a delicious bedouin dinner and bedouin tea. After breakfast you will ride by camel to the White Desert, a vast, beautiful, and secluded area on the borders of Wadi Rum. When you arrive at the middle of White Desert you will have lunch and rest for 2 hours. Then you and your guide will ride back to the camp by camel and wait for the sunset. On the next day, after breakfast, we will drive you back to Rum village .